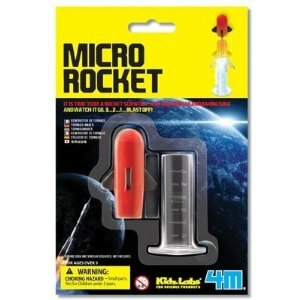 Kidz Labs Micro Rocket - spacekids - space toys, dressing up costumes, kids spacesuits, astronaut food, cool space stuff! This 4M Kidz Labs Micro Rocket Launcher offers kids quick and easy science experimentation that might just spark a larger interest in how things work and what else they can do with science. Fill the launcher with vinegar and baking soda, slip in the foam rocket and watch the chemical reaction send it flying!